Xiaomi Mi1, (often referred to as Xiaomi Phone) (simplified Chinese: 小米手机; traditional Chinese: 小米手機; pinyin: Xiǎomǐ Shŏujī), is a high-end, Android smartphone produced by Xiaomi. The device uses a Qualcomm Snapdragon S3 (dual core, 1.5 GHz) as its CPU and an Adreno 220 as its GPU. The device is initially sold at a price of ¥1999. When it was released, the device received more than 300,000 pre-orders in the first 34 hours. On 20 December 2011, the company announced a partnership with Chinese telco China Unicom. The plan was to offer one million custom Mi1 models at ¥2699 at Unicom stores on various two to three-year term contracts. Xiaomi is shipped with MIUI pre-installed, but also supports stock Android ROMs and other 3rd party ROMs, and is in consideration to add Microsoft's Windows Phone 7 to the phone. The casing of the Xiaomi Mi1 is mostly made from plastic, with SIM card slots located inside. The microUSB port is located at the bottom of the device with the audio jack located at the top of the device. The volume keys were located on the right side of device meanwhile the power key was located at the top of the device. Near the top of the device are a front-facing camera and proximity sensors. The device is widely available in white, pink, blue, yellow, purple and grey color finishes. 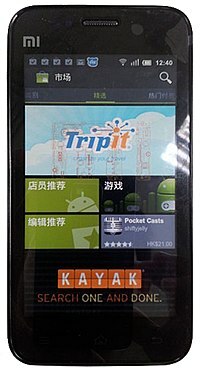 The device's display is a 4-inch, TFT capacitive touchscreen with a resolution of ~245ppi. The Xiaomi Mi1 ships with Android and Xiaomi's MIUI user experience. Updates for the Xiaomi Mi1 is available in three channels: stable, developer and daily. New stable builds are usually available every month with major changes between each update, new developer builds are usually available every week with small but sometimes significant features added between each update and new beta builds are usually available every Wednesdays and usually only contain small fixes and optimizations. Beta builds are only available to some beta testers selected on MIUI's community forums. To update between versions, users usually use an over-the-air updater application. ^ "Xiaomi Phone with MIUI OS: a $310 Android with 1.5GHz dual-core SoC and other surprises". Engadget. 2011-08-16. Retrieved 2011-09-07. ^ "小米帐户 - 登录". Xiaomi.com. Retrieved 2013-07-28. ^ "Xiaomi Phone faster, cheaper than iPhone4". China Daily. 2011-08-19. Retrieved 2011-08-23. ^ Lai, Richard (2011-08-16). "Xiaomi Phone with MIUI OS: a $310 Android with 1.5GHz dual-core SoC and other surprises". Engadget.com. Retrieved 2013-07-28. ^ Wee, Willis (2011-09-07). "Xiaomi Phone Fills All 300,000 Pre-Orders in 34 Hours". Penn-olson.com. Retrieved 2013-07-28. ^ Wee, Willis (2011-12-20). "Xiaomi, China Unicom Announce Cooperation". Penn-olson.com. Retrieved 2013-07-28. ^ "小米支持原生Android和MIUI两套系统 - 小米活动 - 小米手机官网社区论坛 - Powered by Discuz!". Bbs.xiaomi.com. Retrieved 2013-07-28.